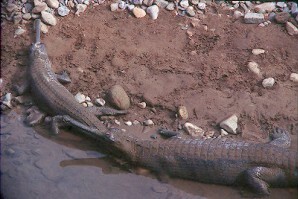 The Gharial (Gavialis gangeticus) derives its name from the large cartilaginous protuberance, which resembles a 'ghara' or pitcher at the end of the snout in males, and is most pronounced in large males of the species. While the function of this is not fully understood, it is believed to form an important component in sexual display. A very sleek and smooth looking crocodile, Gharial appear primarily grayish in colour, with darker bands more conspicuous on the dorsal ridges along the long and tapered tail. Gharial attain the maximum length of any other crocodile found in South Asia, and there are records of up to 6.6m (21.65 feet). Restricted to North India, Nepal and Pakistan. The Chambal River in Rajasthan, Madhya Pradesh and Uttar Pradesh has become a major stronghold of this species. 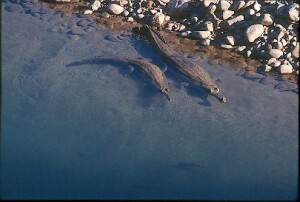 Gharial occur in tributaries of the Ganges and the Yamuna (Ken, Son) and are also reported from the Brahmaputra. The Indus in Pakistan is the main home of the Gharial there, while in Nepal they are found in the Karnali, Kali, Kosi and Narayani rivers. Isolated populations are also found in the Girwa and the Mahanadi in Orissa. Their continued existence in Bhutan, Bangladesh and Myanmar is doubtful. Possibly the best places to see Gharial in the wild are at Corbett National Park in India and Royal Chitwan National Park in Nepal. The most aquatic of all crocodiles, they apparently cannot assume an upright position for walking on land. Gharial are creatures of large fast flowing rivers and only leave the water for basking. An exclusively fish eating crocodile, its long beak-like snout - sharply demarcated from the head - has sharp pointed teeth on both sides, and is ideally suited for grabbing fish with a sideways sweep of the head. Fish are swallowed whole and head first. Eggs are laid in holes excavated by the female in high sandy banks along the river usually in March and April. The nest can contain from 30 to 65 eggs, though clutches of up to 90 have been recorded. The female fiercely guards the nest during the incubation period of 75-80 days. When the eggs are about to hatch the hatchlings call from inside the egg. This stimulates the female to start digging, and help the young emerge from the nest and head for water. The young are sustained for the first few days of their life by the yolk sac but soon learn to catch and feed on small fish. Thereafter they grow very rapidly at an approximate rate of 45cm/year for the first 5 years. The females start breeding when they attain a length of 3m. Singh L.A.K 1978: Ecological studies on the Indian gharial(Gavialis gangeticus)-Utkal University, Orissa.